A distinctive silver bangle from the Clogau Am Byth collection. 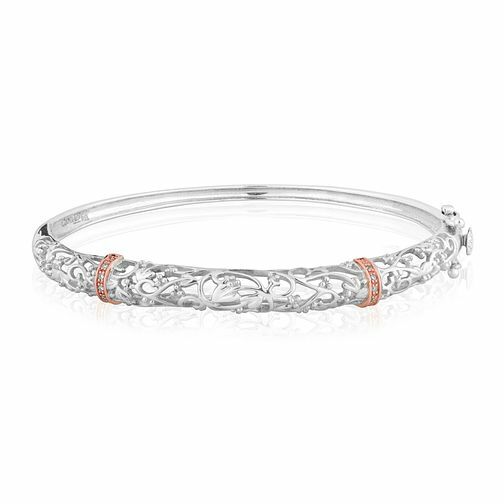 Boasting a twisting filigree design with diamond embellished accents of 9ct rose gold, this unique bangle is perfect for making an elegant statement. Clogau Am Byth silver & 9ct rose gold diamond bangle is rated 5.0 out of 5 by 1. Rated 5 out of 5 by Anonymous from Absolutely stunning bracelet I bought this bracelet to match a necklace I have from the same brand. It is a really beautiful piece and I get some lovely comments every time I wear it. The safety clips on each side of the bracelet give me reassurance when I wear it that I'm not going to lose it. I have quite small wrists and this is a perfect fit for me.